Citizens of Osaka, Japan, are a peaceful lot not generally accustomed to seeing red. 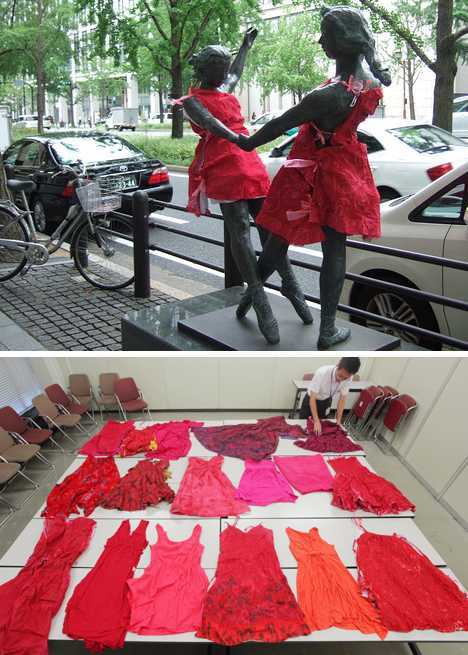 All that changed on the morning of July 25th when pedestrians on “Midosuji Sculpture Street” were greeted by 19 bronze statues outfitted in a variety of fashionable red dresses placed there by an anonymous (but artistic) urban prankster. All dressed up with no place to go? 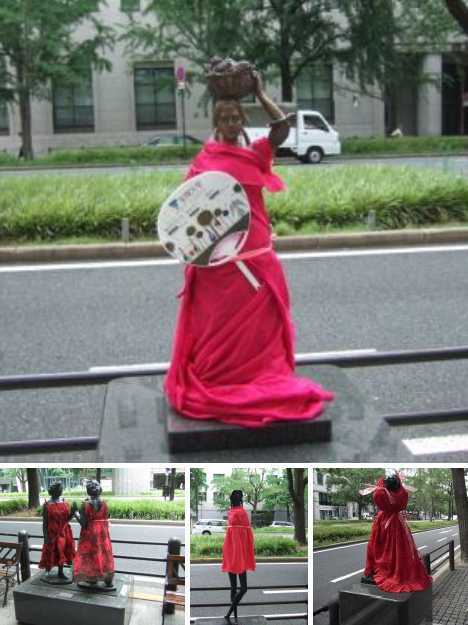 Such was the scene on the morning of July 25th, 2011, when bleary-eyed pedestrians out for an early morning walk along Osaka’s Midosuji Boulevard noticed something was different… the familiar bronze statues along both sides of the street were showing a lot less “skin” than usual. 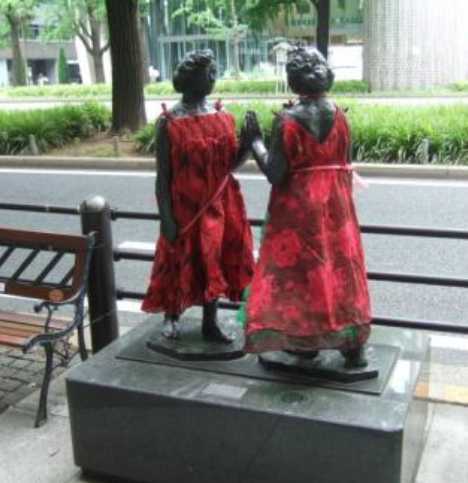 It seems that sometime the previous night, one or more persons stealthily made their way down Midosuji Boulevard – not a straightforward task in itself, considering Midosuji is one of Osaka’s most famous central streets – carefully choosing and then clothing 19 of the 29 bronze statues in red clothes suited to match their depicted age and gender. The guerrilla artist responsible was caught on security camera footage but all that’s known to this point is he or she rides a bicycle. Or maybe it was a unicycle… c’mon Japan, if YOU can’t provide better cameras, who can? Let’s take a step back… so-called “Midosuji Sculpture Street” is a wide, spacious boulevard that is, unofficially at least, Osaka’s main street. 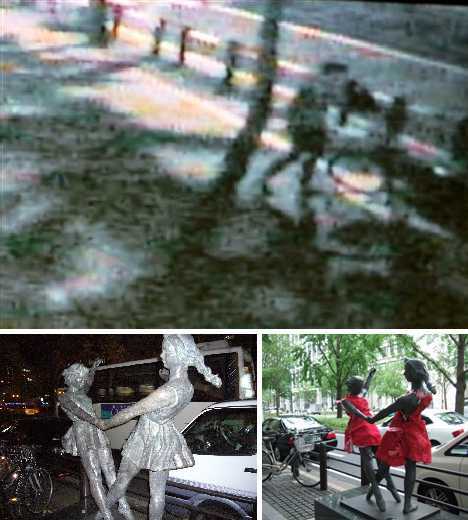 In 1992, the city commissioned a series of figural bronze sculptures with the theme “In Praise of Mankind,” though a good number of the statues are plainly representative of womankind. 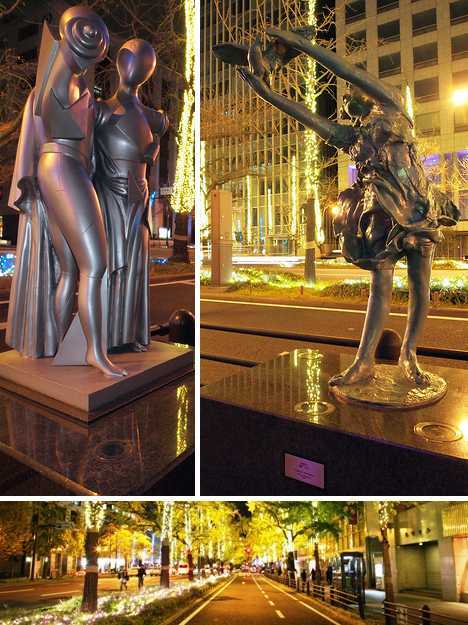 As your average bronze sculptures don’t come cheap, many of the statues set on stone pedestals along Midosuji Boulevard have been donated by large Japanese businesses and corporations. The sculptures themselves are international in character, featuring works by Giorgio de Chirico, Henry Moore, Churyo Sato, Emilio Greco, Shinya Nakamura and August Rodin. Given the status of the sponsors and the location of the statues, it would seem the two dozen-odd bronzes would either be somewhat sacrosanct or a target for those desiring to grab the limelight for themselves. Turns out, both suppositions are correct. 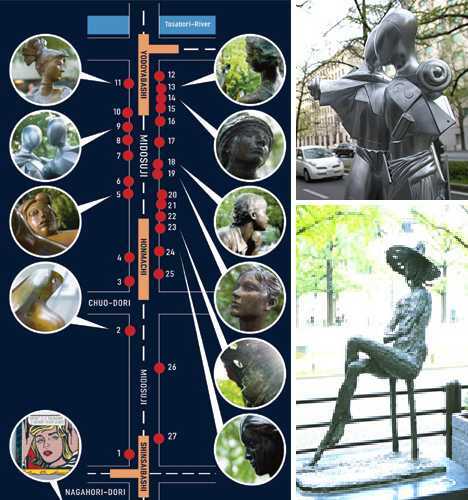 According to the Midosuji Network, a local Osaka organization whose mission is promoting the 2km (1.25 mile) long stretch of Midosuji Boulevard where the statues are located, there had never been any previous reports of “vandalism” to the sculptures. Even so, the artistic merits of the stunt didn’t appeal to everyone. “It wasn’t an aesthetic sight,” said a spokesman for the Midosuji Network’s administration. “The outfits looked like second-hand clothing that had been dyed red. Some pieces were tied on to the statue with red vinyl tape.” Meh, everyone’s a critic. Obviously the fleeting fashionista had little or no opportunity to properly fit his creations to their fixed targets, so a little improvisation (and some adhesive tape) was called for. 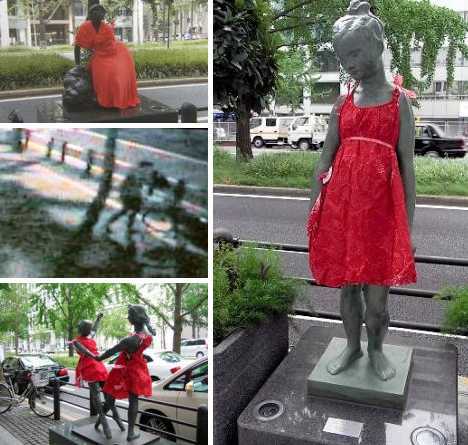 Why red dresses and why were only the female statues targeted by the phantom clothier? Perhaps the perpetrator is a fan of Nana Osaki, a fictional character from the early 2000s manga/anime series Nana by Ai Yazawa. According to Nana’s backstory, her grandmother had forbidden her to wear pink or red but the rebellious Nana buys herself a red dress and wears it to a punk rock concert. Perhaps this writer knows a bit too much about certain manga/anime series. Maybe the vexed Versace-wannabe simply has a thing for The Woman In Red… hey, Gene Wilder did (in 1984), and he’s pretty geeky as geekiness goes. But back to anime, manga and comics: The Woman in Red, from the classic comic book that debuted back in 1940. 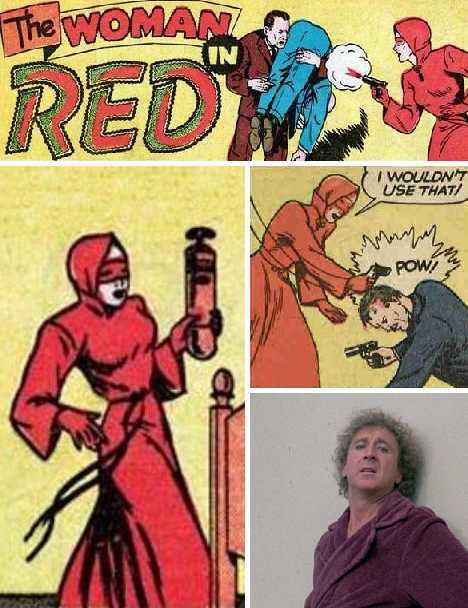 Policewoman Peggy Allen fought crime decked out in a red floor-length coat, hood & mask and was arguably the first female costumed superhero… someone fans of cosplay today might view with a certain degree of reverence. 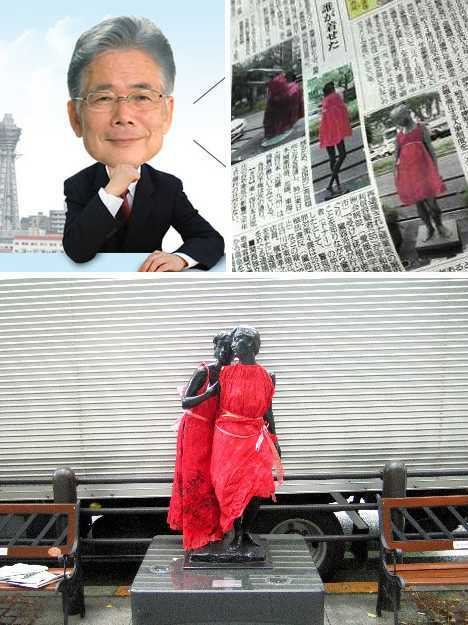 Mayor Hiramatsu, who doesn’t have a background in the art or fashion industry, nevertheless said the dressing of the statues was “so carefully done that it makes me think the person who did it was trying to express something.” Hinting he was willing to let bygones be bygones, the mayor extended an invitation to the mystery man to participate in a creative event called “Midosuji Design Street” being held this September. 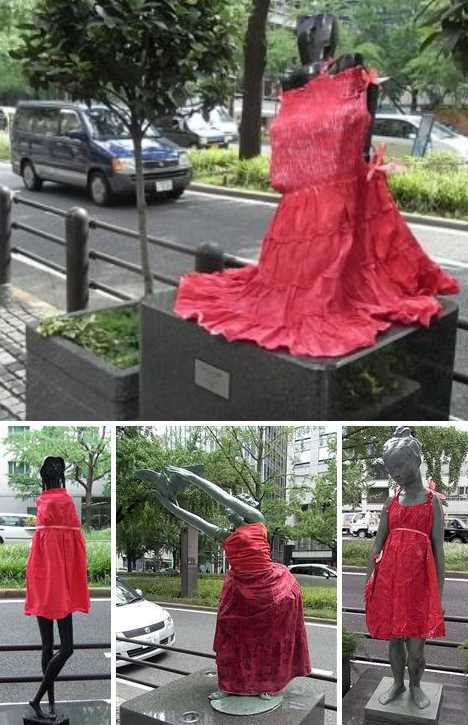 Hopefully he’ll attend; it’d be a shame if the person who left Osaka’s statues dressed in red were to leave the city’s glitterati red-faced.